The traditional sweet biscuit is shortbread at its very very best. Burrbrede, or shortbread, is a traditional Scottish flour confectionery, made from three ingredients. Although a proper recipe wasn’t memorialized in a cookbook till 1736, shortbread has been a Scottish treat since at least the 12th century. 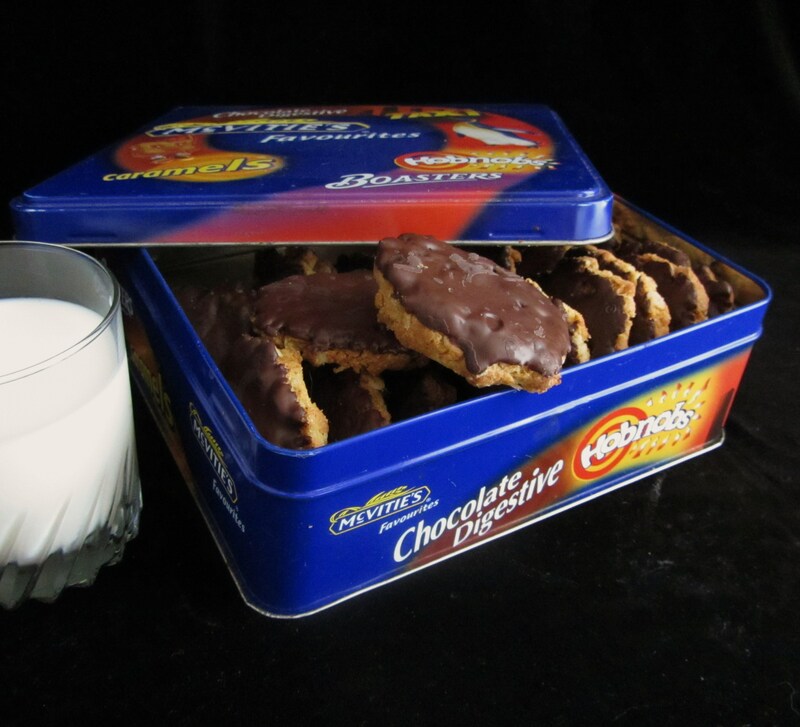 Perfect with tea or a glass of cold milk, these biscuits are difficult to stop eating. Soft, flaky texture, and just a bit chewy eaten straight from the oven, these biscuits get an enormous stamp of approval from us! The modern biscuits are our take on the glorious Hobnob, king of all chocolate biscuits. Clearly we’re big fans, and these home made hobnobs shape up pretty well. A bit more rustic and oaty than the store bought variety, they are equally as delectable when dipped in hot tea. This batch filled our biscuit jar, and were gone in record time! Sift the flour into a bowl and rub in the butter. Once the mix resembles bread crumbs, rub in the sugar to form a paste. It will be short and crumbly, but gather it and form a disc. Wrap in cling film and chill for 30 minutes. Preheat oven to 325 F. Line a baking sheet with parchment paper. Roll out the dough to 1/3″ and cut into shape. Lay on the baking sheet and bake for 10 to 15 minutes. Be sure to not burn the biscuits; their color should remain very pale. Remove from oven and rest for one minute before moving to a wire rack to cool. Cooks note: Shortbread is traditionally made in three shapes: rounds, or bannocks, rectangular fingers, and triangular “peticoat tails”, the favorite of Mary, Queen of Scots. Preheat oven to 350 F and grease or cover pan with parchment paper. Mix the flour, baking powder, sugar, and oats. In a small saucepan, melt the butter then remove from heat. Stir in the golden syrup. In a small bowl, mix the baking soda with the hot water, then stir into the butter mixture. Add the wet ingredients to the dry ingredients and mix well. Roll dough into walnut-sized balls and place on the baking sheet, leaving about an inch on all sides of each cookie to allow for spreading. Gently flatten the balls slightly, they will flatten more when baked. Bake for 10 minutes or till golden. Remove from oven and allow to rest for 5 minutes. The move the cookies to a wire rack and bake the next batch. For the chocolate topping, break the chocolate into small chunks and place in a small bowl. The easiest way to melt the chocolate is to microwave it for 1 minute, and stir till it all melts. Microwave for an additional 30 seconds if needed. Dip the bottom of each biscuit in the chocolate, and place on a baking sheet, chocolate side up. Allow chocolate to set overnight. Enjoy with a cup of tea for dunking! Makes about 20 biscuits. Oh my, hobnobs! I came across these in London many moons ago, and then found them in an “international grocery” here in the states. Dangerous knowing how to make them! Thank you! did I read that right? a whopping 1.25 pounds of butter? You sure did :) To be fair, the recipe does make a ton of biscuits. And with butter as the only binding ingredient, there was bound to be a load of it! A popular additional ingredient in Scottish shortbread is ground rice (not rice flour) – it makes the wheat flour go further and adds a lovely nutty texture, even though it’s finely ground. Making the paste into a long cylinder, rolling it in brown sugar and then cutting it into 1/4″ discs allows you to make circular biscuits with a wonderful crunchy edge. I use what is probably a 19th c. (?) recipe, 1 part dark brown sugar, 2 parts butter, 4(ish) parts flour (if you mix AP and cake, they will be very flaky). You may have to add a bit more flour if it’s a damp day. Also, I don’t use a rolling pin, just shape by hand. They have a lovely caramel taste, but not TOO sweet. You may have to be careful with ‘parts’. A cup of flour and a cup of butter do not weigh the same. If the ‘parts’ intends weight, using cups will give a slightly different result – a bit heavy on the more solid ingredients. It probably doesn’t mater for smaller amounts, but if you are scaling up for a party it could be significant. I think that recipes given in ‘parts’ would probably refer to volume (cups) otherwise it would be sensible to give weights. Well, I know what I will be doing for the rest of the day! Woot, time to fill the cookie, sorry, biscuit jar! Hobnobs, eh? “The SAS of the biscuit world”? DIP ME AGAIN! Those Modern Sweet Biscuits sound a lot like ANZAC biscuits. For the traditionnal burrbrede recipe. 1st) when you say stick of butters you mean the small sticks (about as tick as the tip of a thumb) or the big bricks of butter (about as thick as the palm of a hand) ? 2nd) approximatly how many biscuits does 1 batch make ?